Successfully Added Quad Band Touchscreen Cell Phone - Accelerometer with Dual SIM to your Shopping Cart. Unlocked quad-band cell phone with a 2.7 inch display and dual SIM card slots in a slick designed dark platinum casing with hot accelerometer motion sensitive media features and touch screen control. With native quad-band GSM/GPRS to keep you connected all around the world and dual SIM slots (with dual standby) allowing you to have two active phone numbers within the same phone, this is any frequent travelers ideal mobilephone! Of course any modern mobile phone needs to be easy to use and have plenty of easy to use media features, right? You better believe it! What you have here is everything you will ever need in a cellphone; modern phonebook + contact manager, easy to use touch screen keypad for dialing and messaging, TV and FM radio receivers, MP3/MP4 players, digital camera and video recorder, image viewer, portable file storage, Ebook reader, Bluetooth, and daily software tools. However, phone functionality and ease of use are where this baby shines. The display on this phone is very crisp given its compact size while the navigation menus are simple to use via touch or the simple navigation keys. This is one phone that truly works well for both business and pleasure. 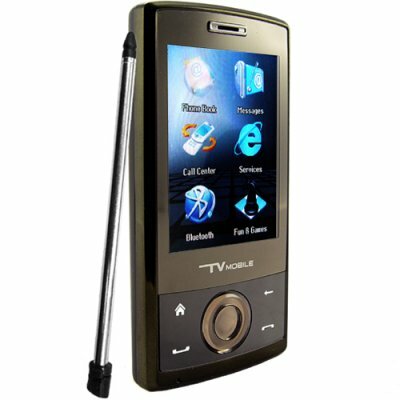 The CVDQ-M01 quad band touchscreen mobile phone is proudly brought to you by Chinavasion Electronics. Order your stock now and don't forget to look at our Bluetooth adapter section of the website for earpieces and other accessories you can utilize while you are making calls while on the road. How do you send a text without using the pen! It is possible to send a text without the stylus if you have small fingers. For this reason, we recommend using the stylus as you cannot change the screen resolution. This phone is very good - like reception on both sim cards,very good quality sound, battery OK - around 4-5 days , nice software and good response. This will be my second purchase at Chinavasion. The first purchase was of a very good quality. Therefore I have no doubts to do more purchases. on 2009-11-10 22:19:15 piccolo prezzo grandi prestazioni! Ho ricevuto da qualche giorno questo splendido mobile phone! tra i pregi oltre al prezzo , le numerose funzioni che offre: radio, tv, lettore mp3, player foto, registrazione video foto, della radio della televisione, molto leggero, ottimo audio dello speaker, legge due sim contemporaneamente, ottima durata delle batteria! Non riscontro particolari problemi, forse il menù non è proprio intuitivo e l'attacco delle cuffie non è standard ma per il resto è davvero un apparecchio splendido! Grazie Chinavasion! Confermo che la risoluzione delle fotocamera è di 1280 per 960 a differenza di quanto riportano le indicazioni!